Page title: What Constitutes Our Constitution? In 2007, Steve Jobs appeared on stage at MacWorld in San Francisco in his iconic black turtleneck to unveil the iPhone: a mobile phone, a web browser, a music player, and a camera all in one. There was no keyboard; everything was contained in one sleek glass-and-metal package. The Canadian Constitution is the antithesis of the iPhone: it is bulky, inaccessible, and decidedly not user-friendly. Not only can no one can tell you exactly when it launched—they would be hard-pressed to tell you what it even is. Our Constitution is not a single document. There is actually no single law that is called “the Constitution” in Canada. This distinguishes Canada from the United States, South Africa, France, Germany, Mexico and most countries. 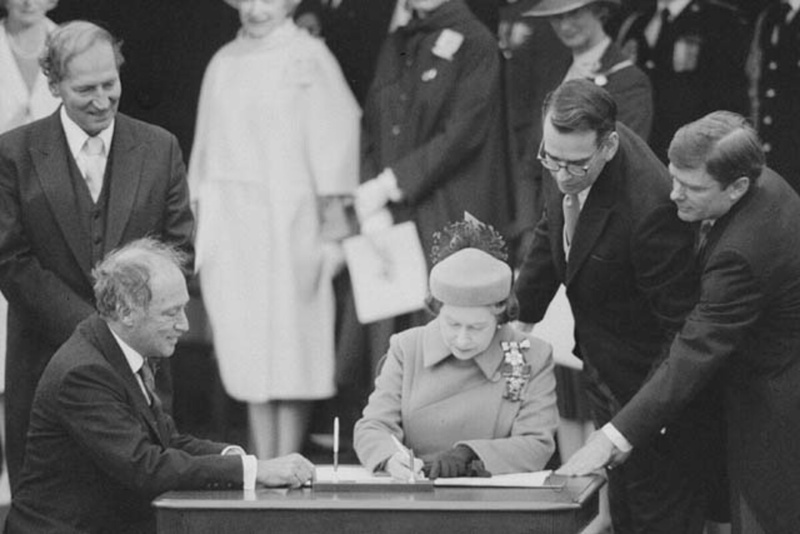 When most Canadians think of “the Constitution”, they probably think of the Canadian Charter of Rights and Freedoms, enacted in 1982 as part of the Constitution Act, 1982. However, to Canadians of an older generation, “the Constitution” conjures up images of the British North America Act. The old BNA Act was enacted by the British Parliament in 1867 to create the Dominion of Canada. In 1982, it got a rebrand: The Constitution Act, 1867. Some Canadians might logically think that The Constitution Act, 1867 plus The Constitution Act, 1982 equals The Canadian Constitution. But they would be wrong. The Canadian Constitution is so impenetrable that it actually has to define what it is. Section 52(2) of the Constitution Act, 1982 is titled “Constitution of Canada.” It says that the Constitution of Canada “includes” not only the two Constitution Acts of 1867 and 1982, but also “Acts and orders” referred to in the schedule to the Constitution Act, 1982. Huh? A “schedule”? Would it have been too much to ask for those involved in the patriation of the Constitution to have thought about integration in the same way Jobs and Jonathan Ive did when creating Apple products? Instead, they did not even incorporate those “Acts and orders” into a single document. Okay, so there are a couple of additional “acts or orders” in the schedule, right? No. Actually, there are thirty. These include separate acts or orders for each of the six provinces that entered Confederation after 1867: Manitoba, British Columbia, Prince Edward Island, Alberta, Saskatchewan, and—more than eighty years later—Newfoundland. I have to make a constitutional mea culpa. For the last twenty years, I mistakenly thought that because there are thirty Acts or orders listed in the schedule, there are thirty more constitutional documents to add to the Constitution Act, 1867 and 1982 (actually the Constitution Act, 1867 is the first act listed in the schedule). That’s what section 52(2) seems to imply. But that schedule is sneaky; not only does it rename various acts (like the BNA Act), it also repeals others – six, in fact. So, the schedule adds only twenty-four more constitutional documents. I offer my apology publicly to students at the University of Ottawa who I misled over the past decade. In my defence, most textbooks make this mistake—I’m ahead of the game by realizing it after only two decades. So that’s it, right? That’s the Canadian Constitution? Not quite: there is, as Steve Jobs would say, One More Thing. How could there be more? The answer is ridiculous. In a 1993 decision, the Supreme Court of Canada said that the list contained in section 52(2) was not exhaustive and that other laws or principles could be “recognized” part of the Constitution. In that case, the high court recognized parliamentary privilege as part of the Constitution. Then, in its famous 1998 Quebec Secession decision, the Supreme Court recognized a new constitutional species – unwritten constitutional principles. These unwritten principles are, at least theoretically, on par with written provisions of the Constitution. They include federalism; democracy; the rule of law and constitutionalism; and the protection of minorities. In a previous case dealing with judicial salaries, the Supreme Court had recognized judicial independence as another one of these. And there could be more—though, mercifully, there haven’t been so far. When we actually look at the text of the Constitution, there is no interface that helps you navigate it or tells you the most important elements. It’s like it is written in code. Take the Prime Minister for instance. Canadians know that the PM is the most powerful political official in the country, but they would not get that impression from reading our Constitution. Canadians would likely be surprised to find out that in our Constitution, the Prime Minister barely warrants a reference. The British North America Act did not even mention the Prime Minister. It didn’t need to because, as the Fathers of Confederation set out in the preamble to the Constitution, the plan was that we would have “a Constitution similar in principle to that of the United Kingdom.” This meant a constitution that was largely unwritten, based on centuries of understood constitutional practice that had not been, and did not need to be, reduced to writing. Everyone in 1867 understood the constitutional code. Fast-forward to 1982, and the only thing in the Constitution Act, 1982 about the PM relates to the holding of constitutional conferences and their responsibility to send out invitations. It would appear from our constitution that the PM is some sort of event planner—unless you know the code. If you do, you would know that Sable Island, despite its proximity to Nova Scotia, is actually under federal jurisdiction. Why? It was the graveyard of the Atlantic where ships from around the world often ran aground and were in need of rescue and salvage, and that was too expensive a responsibility to place on the debt-ridden province of Nova Scotia. The Constitution is actually the source of many great Canadian stories. Well-known stories like the Famous Five—the five women who took their fight all the way to London where in 1928 the Judicial Committee of the Privy Council declared that women were “persons” under the Canadian Constitution. It also includes lesser known tales like that of the Confederation Bridge which links Prince Edward Island to New Brunswick at a cost of a billion dollars to the federal government. When those savvy Islanders entered Confederation in 1873, they secured a promise from the feds in the Terms of Union for “continuous communication” with the mainland. As we embark on celebrating Canada’s 150th birthday next year, less high-profile will be celebrations of the 150th anniversary of Canada’s Constitution. Our challenge will be to try to decode it and make it accessible for all Canadians. Perhaps we need an app for that.